The Global Communicator is our Email Marketing system. 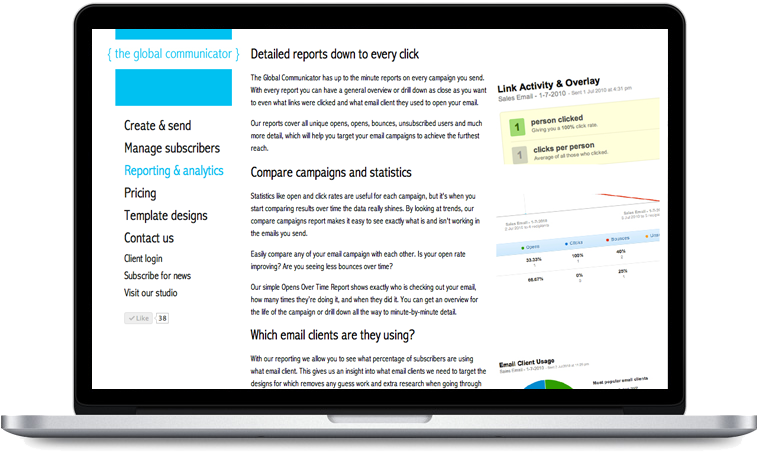 We make it easy to send email campaigns for yourself. We have created our Email Platform to be one of the Leaders in the Market, with extended customer support enabling our customers to maximise the most out of their campaigns. Our approach has always been to offer excellent customer service to enable our customers to create completely custom marketing plans which link into multiple digital platforms from Trade Shows right through to micro sites and fullsite integrations. Over the years we have successfully managed to send over 200,000 emails and growing on behalf of our customers, whilst also completing custom integrations and campaigns for clients such as ISC Sports, ODEX and more.